What Is 10G DWDM C-band Tunable XFP Module? WDM (wavelength division multiplexing) technology, based on the concept of using multiple wavelengths of light on a single fiber, has been very popular in today’s data transmission. Dense WDM (DWDM) is one type of WDM which uses the C-Band transmission window with denser channel spacing. In a 10G DWDM network application, there are multiple transceiver choices for you. Among them, this article will introduce one option for you, DWDM C-band tunable XFP module. The tunable DWDM transceiver is a unique product which enables you to set the channel or “color” that the laser emits. This type of transceiver has been around for a number of years but it was not until 2008 that the first tunable optics were available in the pluggable XFP form factor. Tunable transceivers are only available in DWDM form because the CWDM grid is too wide. Typically these tunable optics are for the C-Band 50GHz. Around 88 different channels can be set with intervals of 0.4nm, which is the 50GHz band. Tunable transceivers are typically used as “spare-optics”, in case of emergency, because you can tune them to the right channel and reduce the amount of spare optics you need to hold in stock. 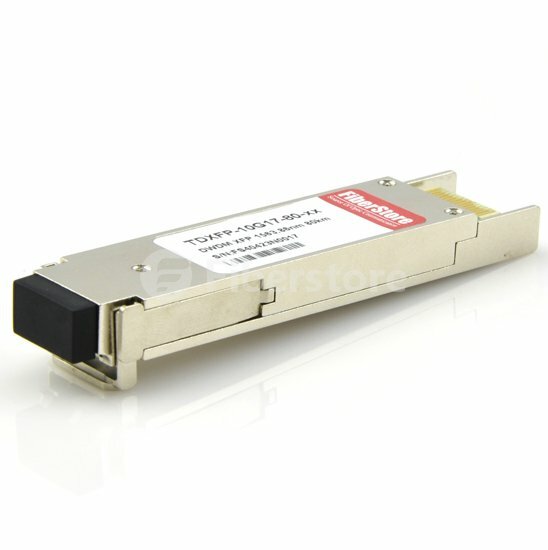 DWDM tunable XFP 10 Gbps multiprotocol optical transceiver is an integrated fiber optic transceiver that provides a high-speed serial link of signaling rates. The module complies with the 10 Gigabit small form factor pluggable (XFP) multi-source agreement (MSA), and the ITU-T G.698.1 S-D100S1-2D standard. It features a hot-pluggable XFI-compliant electrical interface. DWDM tunable XFP transceiver integrates the receive and transmit path on one module. On the transmit side, the 10 Gbps serial data stream is recovered, retimed, and passed to a modulator driver. The modulator driver biases and modulates a C-band-tunable integrated laser, enabling data transmission over single-mode fiber through an industry-standard LC connector. On the receive side, the 10 Gbps optical data stream is recovered from an APD/transimpedance amplifier, retimed, and passed to an output driver. DWDM tunable XFP transceiver is designed to support full range of C-band ITU-T wavelength data rates from 9.95Gbps to 11.3Gbps and distances up to 80km. The image below shows a Cisco ONS-XC-10G-C compatible 10G DWDM tunable XFP transceiver. DWDM tunable XFP pluggable module allows enterprise companies and service providers to provide scalable and easy-to-deploy 10 Gigabit LAN, WAN, and Optical Transport Network (OTN) services in their networks. This module is a high performance and cost effective XFP transceiver module designed for 10G SDH/SONET, IEEE DWDM 10GBASE-ZR for 40 or 80 km reach (Ethernet), and DWDM 10G FC (Fibre Channel) for 40 or 80 km reach applications. It’s also good for switching wavelength and details can be found in this article Wavelength Switching Solution: Tunable XFP Transceiver. Fiberstore offers a variety of optical modules for extensive applications like telecommunication, datacommunication, and CWDM/DWDM network. Fiberstore’s DWDM C-band tunable XFP transceivers can be designed to be compatible with many major brands while delivering the deployment flexibility and inventory control. And Fiberstore provides a variety of industry standard from factors including SFP+, X2, XFP, SFP, like Avago AFBR-709SMZ compatible 10GBASE-SR/SW SFP+ and Allied Telesis AT-SPSX compatible 1000BASE-SX SFP transceivers, which can make the customers satisfied with the broad choices and high performance. This entry was posted in XFP/GBIC/X2/XENPAK/PON SFP/3G SFP and tagged 1000BASE-SX SFP, 10GBASE-SR/SW SFP+, DWDM C-band tunable XFP module, SFP transceiver, tunable xfp, X2, XFP Transceiver on March 10, 2016 by Admin.